Uttar Pradesh is located in the northern part of the country. This state was founded on 1st April 1937.The state has a rich history of learning & education. The capital city of UP is Lucknow. Uttar Pradesh has a large number of colleges and universities which offer admission to students in various engineering courses. Indian Institute of Technology (IIT), Indian Institute of Information Technology (IIIT), Banaras Hindu University, etc are the well-known colleges of the state. The average literacy rate of this state is 67.68 %, as per recorded by census 2011. 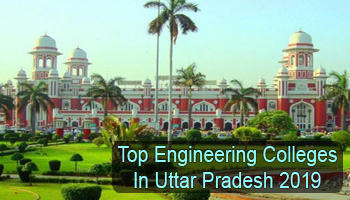 Here, we are providing complete details about the list of Top Engineering Colleges in Uttar Pradesh 2019. We have listed these colleges by the deep research & got the conclusion of top engineering colleges in Uttar Pradesh 2019. The list is comprised of various governments & non-governments colleges including IIT, IIITs, & many other situated at UP state. The admission to the B.Tech course in UP state will be done on the basis of national & state level examination. Candidates will have to apply for JEE Main & UPSEE examination to get admission into engineering courses. JEE Main exam will be organized by NTA to offer admission to the B.Tech & B.Arch programmes. Candidates, those want to join M.Tech programme in UP, they have to apply of GATE. If you have any other queries about Top Engineering Colleges in Uttar Pradesh 2019, you can ask us by leaving your comments in the comment box. Sir i got 208 marks in upsee .Shall I get a good college for cs or IT??? Is Bennett University greater Noida is best engineering institute?